We love to look to fashion industry insiders for inspiration on how to wear denim stylishly. 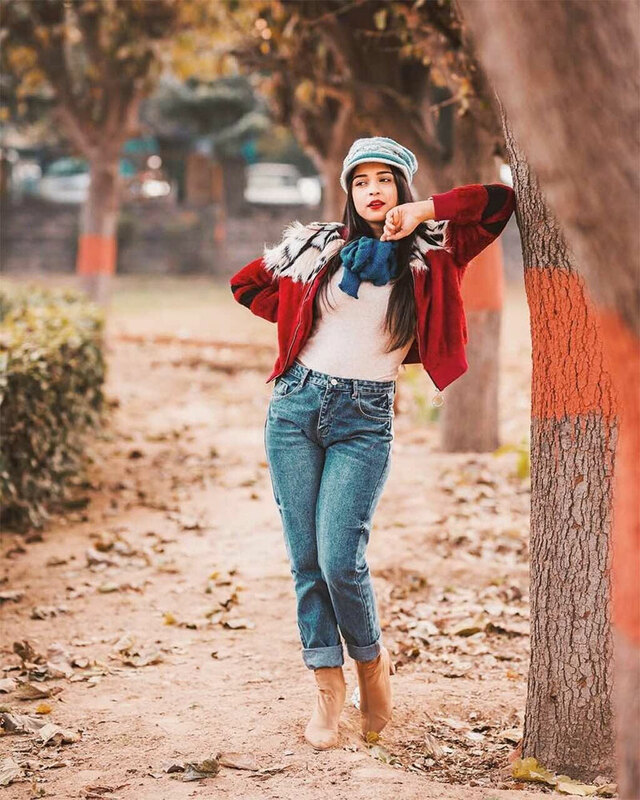 These women are not only experts in what looks good; they are great role models for how to dress in jeans when you want to dress up, for the office and even on casual weekends. Take a look at how 7 of today’s top female fashion magazine editors are dressing in jeans, including tips for each look on how you can steal their style. Alessandra Steinherr knows a thing or two about looking good, as the Beauty Director at Glamour Magazine in the United Kingdom. Here she is making double denim look classic in H&M jeans, a chambray shirt by Gap and a classic trenchcoat. We love the multi-bangle bracelet look she’s rocking, too. Steal Her Style: When wearing denim from top to bottom, go darker with your jeans to make your bottom half look slimmer. Dress up jeans and a tee with accessories. Brittany Kozerski is a Fashion Market Editor for Marie Claire magazine, so you know she’s got her finger on the latest style trends. Here, she looks put-together in ultra-distressed RTA jeans by making smart fashion choices. An Alexander Wang top with ragged detailing at the sleeves and hem is a match made in heaven for ripped jeans. It’s the fashion-forward clutch purse by Poppy Lissiman, though, in a vivid graphic pattern, and peep-toe ankle boots, that upgrade this look from jeans-and-a-tee to fashion statement. Steal Her Style: Dress up a basic jeans and t-shirt look by choosing stylish accessories that reflect your personality. You can also cuff your jeans to create a variety of looks — learn how to do that here. A casual guy-inspired look deserves a feminine touch. 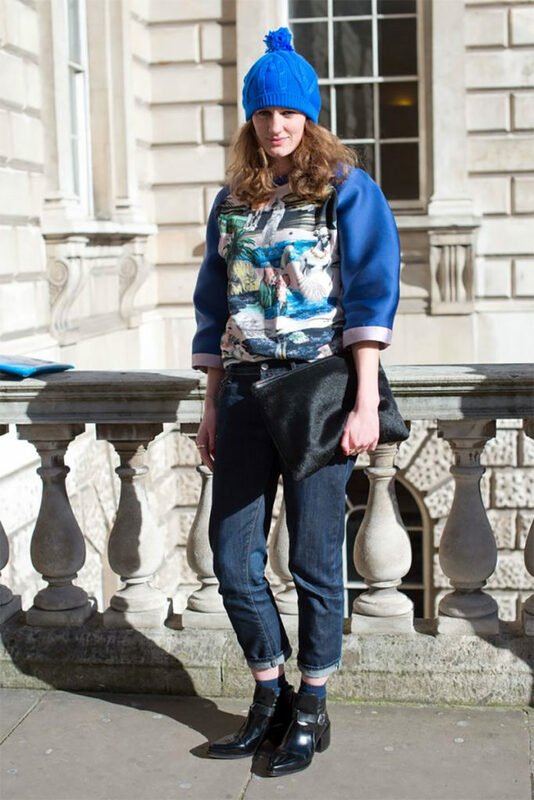 Emma Sells is a Fashion Editor at Elle Magazine with a distinct sense of personal style. Here she is, attending the London runway shows, in a cool, casual boy-meets-girl outfit that’s easy to copy and wear. Emma pairs relaxed Gap boyfriend jeans, sturdy ankle boots, and a basic woolen hat, with a Louise Armstrong floral top and an oversized clutch purse. Style Her Style: When you’re wearing borrowed-from-the-boys jeans, play against type with a top that’s frankly feminine, for an easy, eye-catching outfit. Here’s a go-to jeans outfit as worn by a fashion magazine editor. Jessica Minkoff, Marie Claire’s Senior Marketing Editor, attended the London fashion collections in this effortlessly chic jeans outfit we’d wear from the office to cocktails. She pairs vintage-wash, distressed RTA Denim jeans with a patterned Proenza Schouler shirt and bag, ALC biker jacket, gladiator sandals, and classic aviator sunglasses. Steal Her Style: Jeans and a leather moto jacket go together like peanut butter and jelly. You can dress up this outfit with glamorous shoes and a standout purse, or keep it low-key in chic flats and a quieter handbag. Sophia Panych is a Beauty Editor at Allure Magazine who is often photographed at industry events. Here, she demonstrates a trendy fashion combination you’ll be seeing in magazines and the streets this year. A denim top is a great way to balance a romantic floral midi skirt and make your outfit look modern and approachable. Wear this outfit for denim-friendly days at the office to stand out from your colleagues and impress the boss with your sense of style. Steal Her Style: A midi skirt calls for high heels. Choose a pair that closely matches your skin tone, to elongate your legs right down to your toes. Layers can look fierce as seen here. Martha Violante is Fashion Editor at Paper Magazine, the edgy periodical that made waves with its “Break the Internet” cover of Kim Kardashian’s rear end. Martha has a signature style that’s not for everyone, but we think she’s fabulous. Here, she uses a Carhart denim jacket as a fashionable (and warming) layer over black leggings and a long white blouse. She tops the outfit with a black Chloe coat and finishes the look with fingerless gloves, librarian glasses, a Christian Louboutin bag, and sturdy shoes. The overall effect is both modern and Victorian, and completely unique. Steal Her Style: Layer a denim jacket between your top and an overcoat to dress down fancier outfits. Pop the collar to frame your face and draw attention to your stylish, extra layering piece. A big scarf dresses up a casual jeans outfit. Naomi Mdudu is Fashion Editor and a senior fashion writer at The Metro, a free UK newspaper with more than 3 million readers daily. Here, she shows how to dress for colder weather in style, with comfortable layers and pops of metallic color. 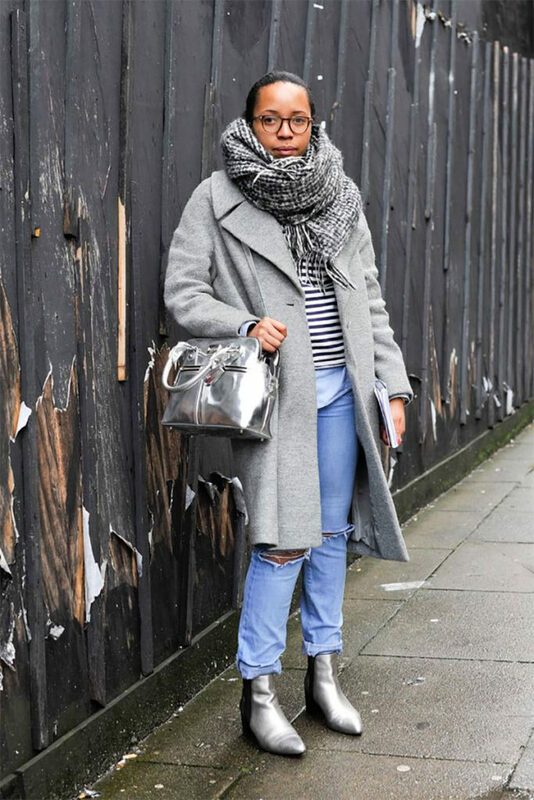 She starts with a classic outfit of distressed, straight leg jeans and a striped top, then layers on a classic wool coat and textured scarf for warmth. A metallic bag and matching boots by Zara add shine and dress up this easy, fall to a winter outfit. Steal Her Style: When your ankle boots are this fabulous, cuff your jeans to show them off. Learn different ways to cuff your jeans here.